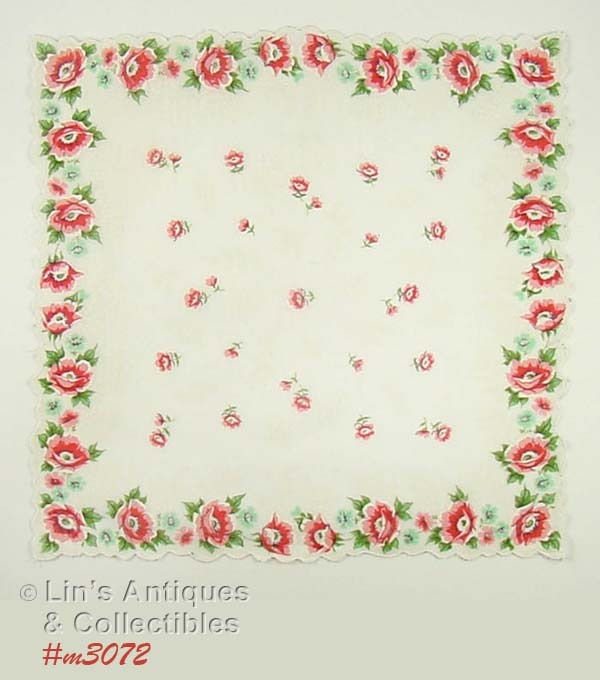 THIS IS ONE OF THE PRETTIEST FLORAL HANKIES WE HAVE IN OUR INVENTORY – PLEASE SEE PHOTO! HANKY MEASURES 16 ¼” X 16” AND IS IN EXCELLENT CONDITION. THIS LOVELY HANKY IS IN NEW CONDITION! IT HAS A BORDER OF ORANGE COLOR POPPIES WITH AQUA COLOR ACCENT FLOWERS AND THERE ARE SMALLER ORANGE POPPIES IN THE HANKY CENTER. I DON’T BELIEVE IT SHOWS IN THE PHOTO BUT THERE ARE SPRIGS OF WHITE COLOR FRONDS ABOVE THE BORDER POPPIES AND ALSO INTERSPERSED WITH THE CENTER POPPIES – REALLY PRETTY! HANKY MEASURES 13 ½” X 13 ¼” – YOU’LL LOVE THIS HANKY! I’M LISTING THESE 6 BEAUTIFUL HANKIES TOGETHER – I CAN IMAGINE THESE AS THROW PILLOWS, ALL DISPLAYED TOGETHER! THEY ARE LARGER SIZE HANKIES – 14 ¼” X 14 ¼” – AND ARE IN EXCELLENT CONDITION. I’VE GROUPED THESE TWO HANDKERCHIEFS TOGETHER BECAUSE OF THEIR SIZE AND THE FLOWER COLORS! ONE HAS A BOUQUET OF PINK AND BLUE CARNATIONS TIED WITH A BIG BLUE BOW, THE OTHER HAS A PINK VASE FILLED WITH PINK TULIPS AND BLUE DAFFODILS. 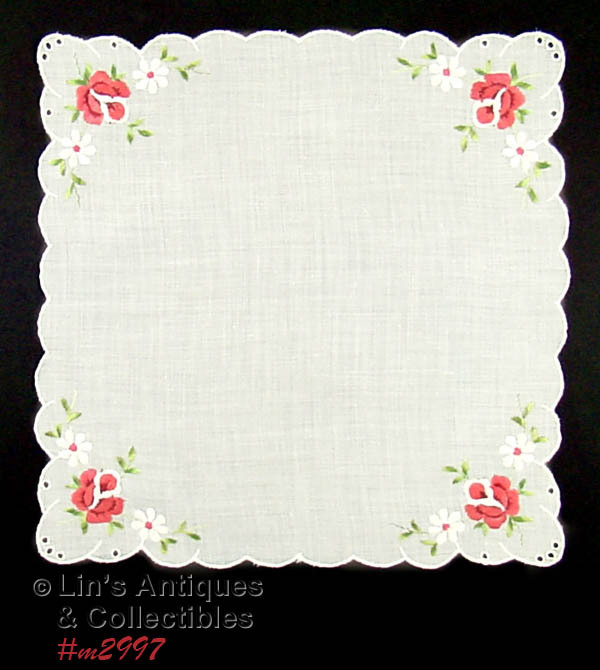 THE BOUQUET HANKY MEASURES 15 ¾” X 15 ¾” AND IS IN EXCELLENT CONDITION. THE VASE HANKY IS SLIGHTLY LARGER AT 16 ¼” X 16 ¼” AND IS WONDERFUL CONDITION – IT HAS A TINY SEPARATION AT THE HEM. BOTH HANKIES ARE GORGEOUS AND WOULD MAKE BEAUTIFUL THROW PILLOWS! YOU DON’T HAVE TO RUIN YOUR VINTAGE HANKIES TO MAKE PILLOWS – JUST “TACK” THEM ONTO AN INEXPENSIVE PURCHASED THROW PILLOW BY HAND-STITCHING EACH CORNER AND ONCE ON SIDE CENTERS OR USE A LONG BASTING STITCH ALL AROUND. YOU CAN ALSO USE RIBBONS TO TIE EACH CORNER ONTO A PILLOW. THESE TWO HANKIES COULD ALSO BE FRAMED FOR EYE-CATCHING WALL HANGINGS! ISN’T THIS A PRETTY HANKY? 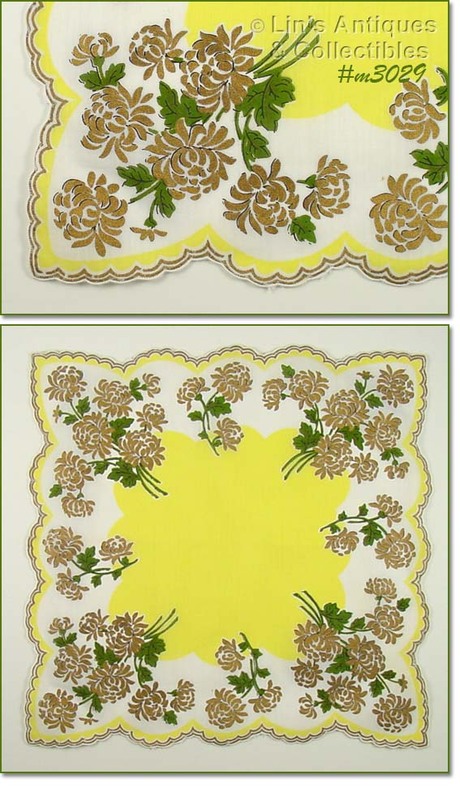 THE SCALLOPED EDGE AND THE FLOWERS ARE ACCENTED WITH GOLD COLOR. MEASURES 13 ½” X 13 ½” AND IS IN EXCELLENT CONDITION. THIS IS SUCH A PRETTY HANKY! IT HAS PRETTY YELLOW DAFFODILS ACCENTED WITH LITTLE PURPLE VIOLETS. HANKY MEASURES 13” X 13” AND IS IN EXCELLENT CONDITION. THESE HANDKERCHIEFS ARE SO PRETTY AND COLORFUL! ONE HAS A LIGHT GRAY BACKGROUND WITH A DARKER GRAY COLOR BORDER AND THE CENTER IS FILLED WITH BRIGHT PINK POPPIES. THE OTHER HANKY HAS YELLOW/GOLD COLOR BACKGROUND WITH A LIGHT KHAKI COLOR BORDER AND THE CENTER IS FILLED WITH BRIGHT RED POPPIES. EACH HANKY HAS 3 SQUARE CORNERS AND ONE THAT IS ROUNDED TO FOLLOW THE SHAPE OF A POPPY! THEY MEASURE 13 1/4" X 13 1/4", BOTH HAVE HAND ROLLED AND STITCHED HEMS AND ARE IN EXCELLENT CONDITION! THIS LOVELY AND COLORFUL HANDKERCHIEF IS UNUSUAL AND NOT YOUR EVERYDAY FIND! THE CENTER IS WHITE WITH BEAUTIFUL BIRD-OF-PARADISE IN THE CENTER. HANKY HAS A BLACK BORDER WITH WHITE HAND-ROLLED HEM, MEASURES 13” X 13 ¼”, AND IS IN EXCELLENT CONDITION. THERE’S JUST SOMETHING ABOUT THIS HANKY THAT I ESPECIALLY LIKE – I THINK IT’S THE COLOR CONTRAST. 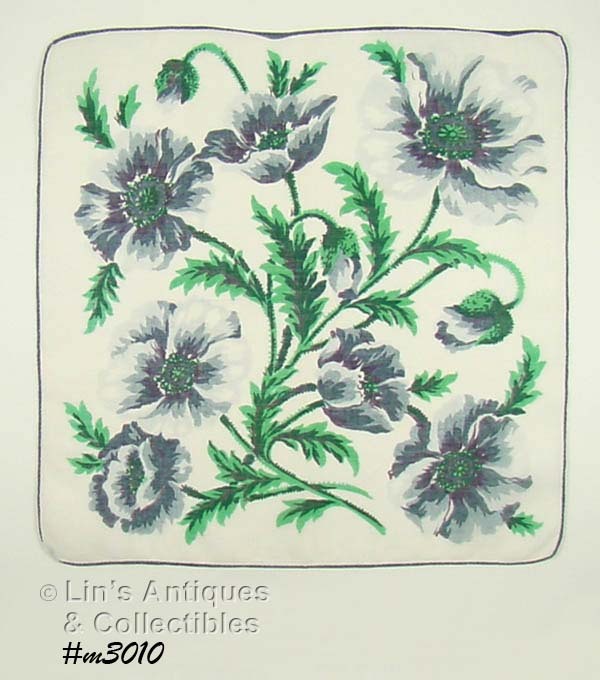 THE HANDKERCHIEF IS WHITE AND IT’S ALMOST COMPLETELY COVERED WITH GRAY POPPIES WITH BRIGHT GREEN STEMS AND LEAVES. HANKY MEASURES 13 ¼” X 13 ½” AND IS IN EXCELLENT CONDITION. THIS HANKY IS UNUSUAL AND VERY PRETTY! 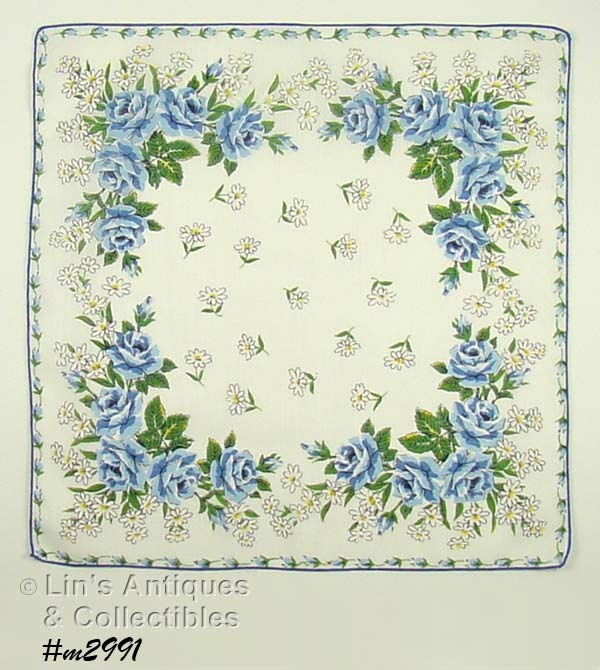 THE HANKY IS WHITE WITH A LARGE BLUE ROSE IN ONE CORNER AND THE CORNER HEM IS SHAPED TO FIT THE ROSE. 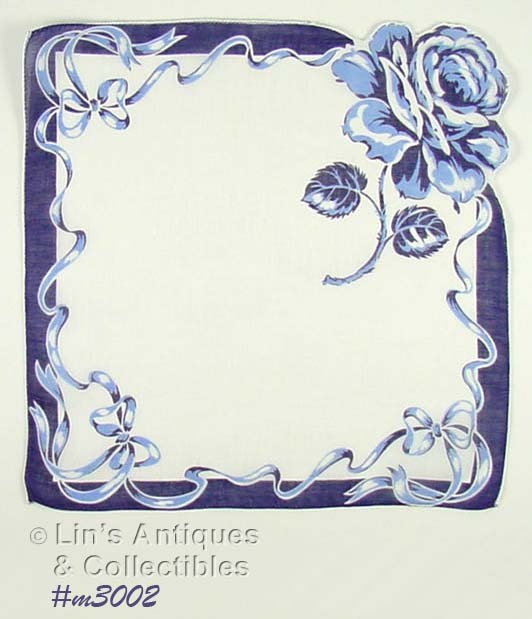 AROUND THE HANKY IS A BORDER/EDGE OF NAVY BLUE AND A PRETTY BLUE RIBBON DESIGN. HANKY MEASURES 12 ¼” X 12 ¼” AND IS IN EXCELLENT CONDITION! 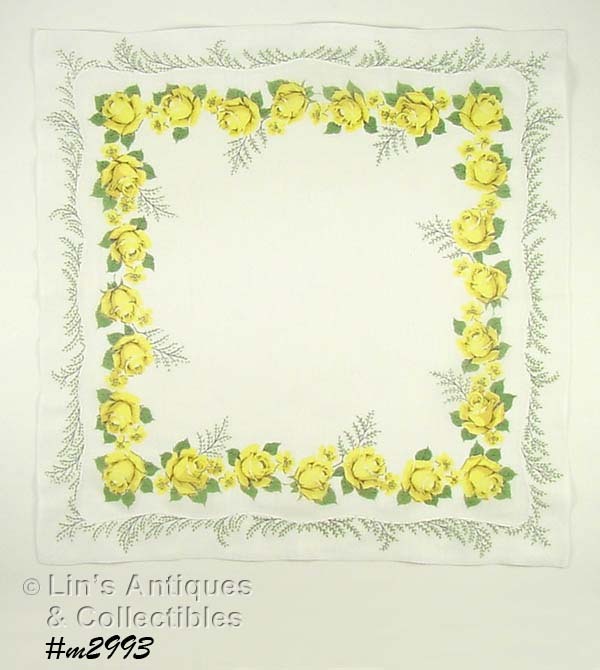 THIS IS A LOVELY AND SOMEWHAT UNUSUAL HANDKERCHIEF! 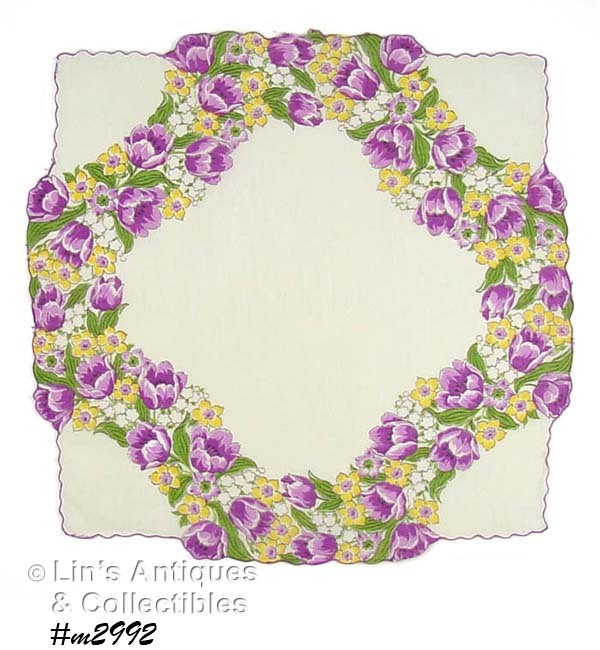 THE HANKY IS WHITE WITH A SMALL EMBROIDERED PURPLE POPPY IN EACH OF THREE CORNERS. THE OTHER CORNER HAS A MUCH LARGER PURPLE POPPY AND TWO SMALL ORANGE FLOWER BLOOMS. THE UNUSUAL PART IS THE LARGE FLOWER IS ATTACHED TO THE HANKY AT THE GREEN CENTER! HANKY MEASURES 12 3/4" X 13", IS IN EXCELLENT CONDITION, AND APPEARS TO HAVE NEVER BEEN USED. 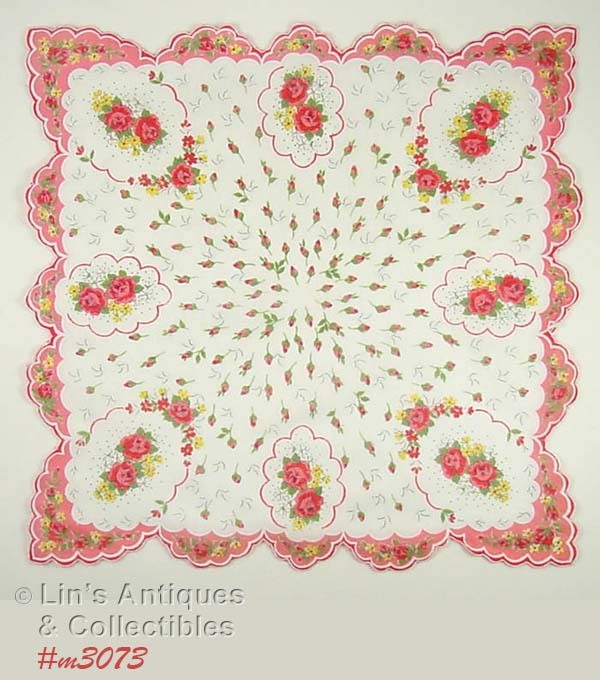 THIS IS SUCH A PRETTY HANDKERCHIEF! THE HANKY IS WHITE WITH A PRETTY PINK AND WHITE ROSEBUD IN EACH CORNER AND THERE ARE TWO WHITE DAISIES WITH PINK CENTERS AND GREEN LEAVES. EACH CORNER ALSO HAS CUT-OUTS THAT GIVE THE MATERIAL THE APPEARANCE OF EYELET. HANKY MEASURES 10 3/4" X 11" AND IS IN EXCELLENT CONDITION. IT APPEARS TO HAVE NEVER BEEN USED. 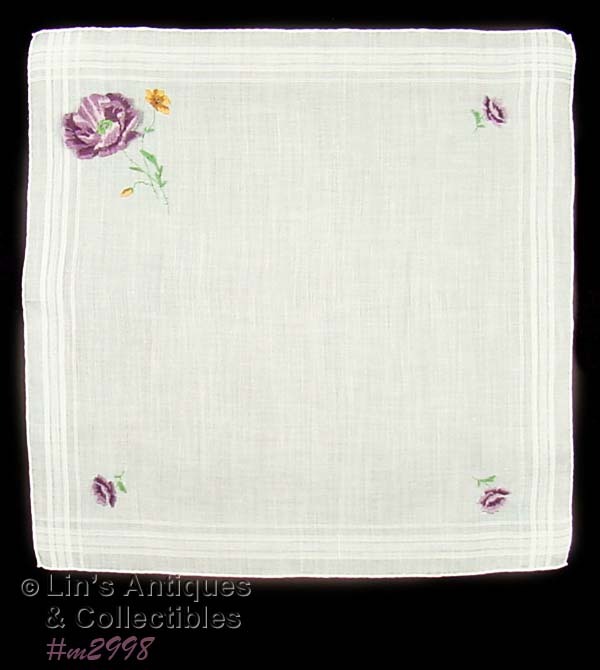 THIS HANKY IS WHITE LINEN WITH AN EMBROIDERED GROUPING OF PURPLE FLOWERS IN ONE CORNER! 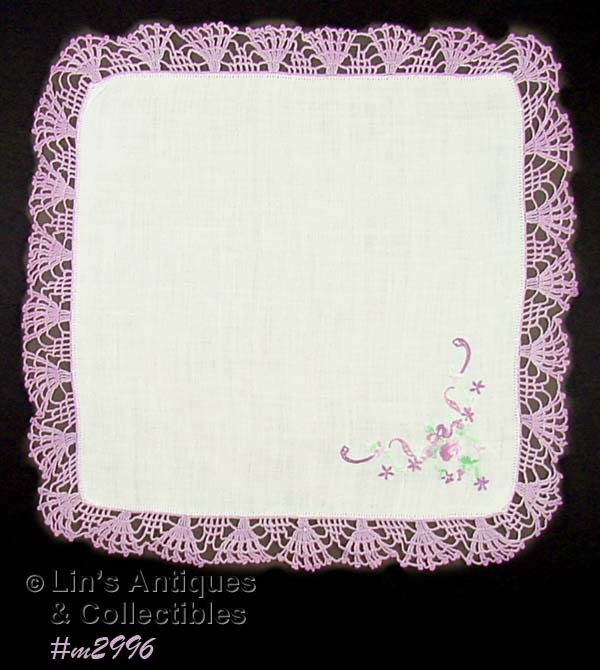 THE HANKY ALSO HAS A LOVELY HAND CROCHET BORDER DONE IN LILAC COLOR THREAD. HANKY MEASURES 11” X 10 ¾”, THE CROCHET ADDS ANOTHER 1 ¼”. IT IS IN EXCELLENT CONDITION! 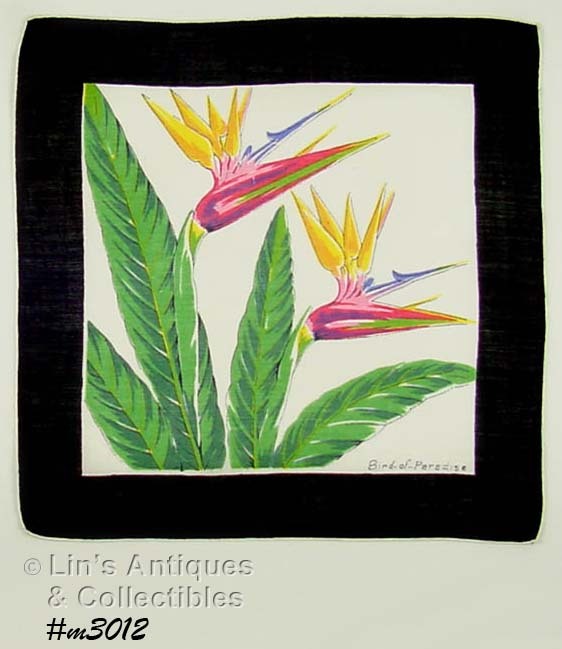 THIS BEAUTIFUL HANDKERCHIEF IS VERY UNUSUAL AND VERY COLLECTIBLE -- BLACK HANDKERCHIEFS ARE DIFFICULT TO FIND!! THIS HANKY IS EVEN MORE COLLECTIBLE BECAUSE OF THE BEAUTIFULLY STITCHED FLOWERS THAT ARE PLACED IN 2 ROWS AROUND THE HANKY BORDER. 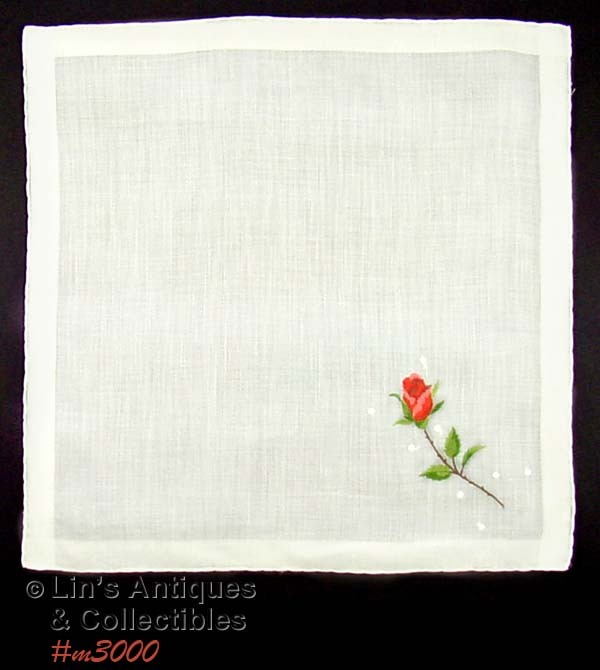 HANKY MEASURES 11 ½” X 11 ¾” AND IS IN EXCELLENT CONDITION! THIS HANDKERCHIEF IS UNUSUAL! THE CENTER IS WHITE WITH A BOUQUET OF YELLOW CARNATIONS, GRAY CARNATIONS, AND GREEN FERN FRONDS TIED WITH A BLACK RIBBON. THE BORDER IS BLACK AND IS DESIGNED TO RESEMBLE LACE – VERY PRETTY! HANKY MEASURES 13” X 13 ¼” AND IS IN EXCELLENT CONDITION. THIS HANKY IS LOVELY! IT HAS A WHITE BACKGROUND WITH YELLOW ROSES ALL AROUND THE EDGE. THE ROSES ARE ACCENTED WITH GREENERY AND THE DOUBLE MATERIAL BORDER HAS THE GREENERY (FRONDS) ALL AROUND. HANKY MEASURES 15 ¼” X 15 ½” AND IS IN EXCELLENT CONDITION! THIS HANDKERCHIEF IS SO PRETTY WITH LOTS OF FLOWERS -- SMALL PURPLE TULIPS, LITTLE YELLOW DAFFODILS, AND LITTLE WHITE FLOWERS. IT MEASURES 13 1/4" X 13 1/2" AND HAS NO STAINS, TEARS, PIN HOLES. THERE ARE THREE PLACES (1/8" AND 1/4") WHERE THE MATERIAL HAS SEPARATED FROM THE MACHINED HEM/EDGING AND THERE IS A PLACE (1/2") WHERE THE MACHINED HEM/EDGING IS MISSING. THIS HANDKERCHIEF IS SO PRETTY THAT I DON'T BELIEVE THESE SMALL IMPERFECTIONS WILL EFFECT ITS USE OR DISPLAY. IT WOULD MAKE A BEAUTIFUL THROW PILLOW AND THE DESIGN IS PERFECT TO DISPLAY VINTAGE BROACHES / PINS! THIS HANKY IS SO PRETTY! IT HAS A WHITE BACKGROUND AND HAS LOTS OF PRETTY BLUE ROSES AND WHITE DAISIES – THERE ARE BLUE ROSEBUDS ALL AROUND THE EDGE! 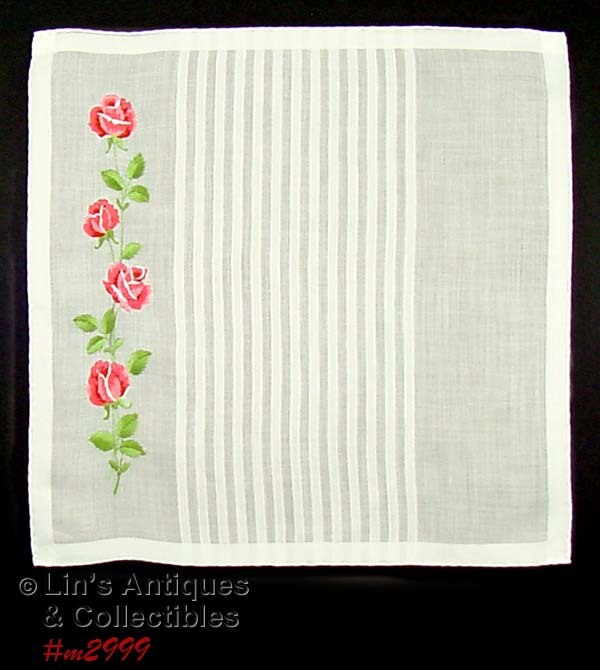 HANKY MEASURES 13 ½” X 13 ¼” AND IS IN EXCELLENT CONDITION!